This ship (integrated tug and barge actually) was heading into the lake this afternoon. 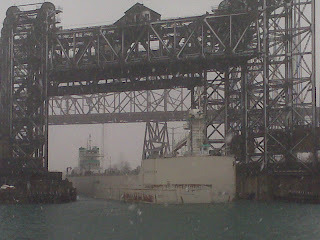 This picture was taken from Crowley's Harbor Master shed on the Calumet River. Behind the railway lift bridge is the Chicago Skyway bridge.